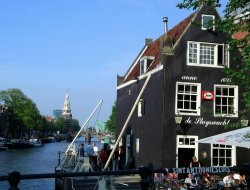 This Amsterdam pub guide lists the best Amsterdam cafes and Amsterdam coffee houses. 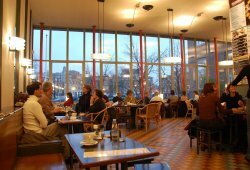 You will often recognize three types of cafes: cosy brown cafes, trendy designer cafes and classical grand cafes. Don't confuse the Amsterdam cafes with "coffee shops", also called Amsterdam cannabis café. The latter sell hash and weed and may not even serve coffee. The Dutch call their pubs café's. Actually, café can refer to many sorts of places that serve beer and liquor (besides coffee, tea, soft drinks etc. ), and usually some snacks and sandwiches, too. 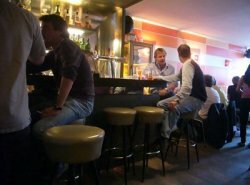 The atmosphere in cafes in Amsterdam ranges from family-type places and intellectual type of places for newspaper reading, to rowdy places for late night drunkenness. 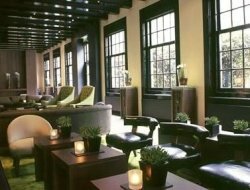 Three types of Amsterdam cafes are most typical of the city - brown cafes, designer cafes and grand cafes. Below are some of the best in each category. 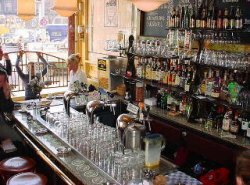 There are also special Amsterdam cafes, like beer cafes and 'proeflokalen' (tasting houses connected to distilleries): see our other Amsterdam pub guide for that. Opening hours vary: while cafes that serve breakfast open at 9 to 10am, others only open at noon or the course of the afternoon. 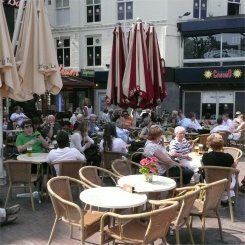 Most Amsterdam cafes remain open until 12pm to 1am, and in the weekends up to 3am. These are cosy, folksy type of Amsterdam cafes, found everywhere the city. The brown refers to dark interiors with lots of old-fashioned wood, and many decades of cigarette smoke. A part of the neighborhood clients seem to be using these cafes as their second living room. This wonderful little café dates from 1695, when it was built as a lockkeeper's house. It's almost scary to enter as the black building is leaning over, but the construction has been fortified. The terrace, overlooking the water and the Montelbaans Tower, is one of Amsterdam's the most pleasant. One of our favorite Amsterdam cafes. Located on one of the most beautiful parts of the Prinsengracht, close to the Anne Frank House and the Westerkerk, this café is popular with students because of it's atmosphere and excellent choice of foods. It's terrace is overlooking the canal. Located at the edge of the Red Light District, the small terrace of this 200 year old cafe overlooks the Nieuwmarkt square, a historic square still used for markets. The building used to be a tram depot. It has a wide choice of beers, and is especially visited by students. This cafe used to be a 16th-century monastery. The interior is historic, with beautiful yellow and dark brown wood work. Don't forget to take a look at the wall paintings. Besides good beers, it serves a quite wide choice of meals too. These are self-consciously modern, trendy places with clean, stylish interiors and carefully selected food and drinks. They cater to a younger audience and to the culturally hip. In all respects, the antidote of the brown cafes. Specializing in quirky interiors, one of its strong sides of Cafe Diep are the diverse clients: from suit and tie guys to artists and other hip people. You can sit on the couches or at the bar. Its own DJ plays music ranging from house to soul. Some say the staff should cut back on weed a bit. Also check out it's trendy neighbor cafe, Bar Bep. Actually the lobby bar of the Dylan hotel-restaurant, the Dylan is posh and hip at the same time. Restaurant guests get seating first, so you're not certain to get in. It has a reputation for drawing very beautiful people. A small, often overlooked gem with an ever changing always hip) interior with comfy sofas for lounging. Located next to the He Hua temple, at the edge of the Red Light District, it's an ideal pre-club spot with its own DJ playing the right tunes. Cocktails are quite reasonably priced. A very trendy cafe drawing very hip people. The interior is a funky, retro mixture of styles perfect for alternative types. Great for a bit of relaxing after a visit to the recommended daily Noordermarkt market (organic food and curiosa). Also check out its designer neighbor, Proust. These are classy cafes in an old-fashioned sense. They are often spacious places, with a reading table offering newspapers and magazines, and a larger choice of quality food. They are more classical than trendy, but the atmosphere is much more upper class than the folksy brown cafes. They are among our favorites. 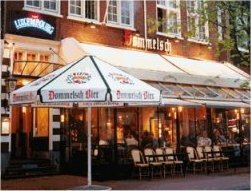 A very spacious, classic cafe with one of the best terraces of the city, directly along the Amstel river from which Amsterdam got its name. The huge reading table with newspapers and magazines also has some English material. This large cafe is entirely in Art Deco style. During the day it's very quiet, while after working hours the local business crowd comes in. Particularly nice is that you can choose between the busy Spui side or the quiet Singel side. There's a wide choice of liquors. On the second floor, Dante runs an art gallery with paintings by Herman Brood. A famous and classy cafe with parquet floors and a marble bar. Its lunch menu is especially appreciated - try the 'Royale' snack platter - but you can dine here too. Also has a wide selection of Belgian beers and a good reading table. 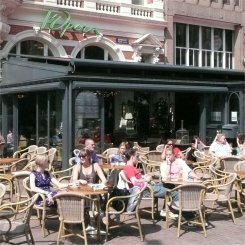 Few Amsterdam cafes have a better international reputation - deserved or not, the New York Times called it "one of the world's great cafes". Dantzig is part of the Stopera, where the big opera theatre and the city administration are, and it's right behind the Waterlooplein market. Local politicians are often spotted here. It's a large and classy cafe, looking a bit like an old library, with a large reading table. Its pleasant terrace overlooks the Amstel river.